which will meet your requirement and needs! All of our packages can be connected to an existing telephone line for back to base monitoring or self-monitoring. Direct wireless unit is $300. Our back to base monitoring monthly subscription starting from AUD $40 per month ($10 per week). 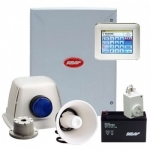 Easily view alarm system status remotely. Allowing you to control your Ness control panel from anywhere in the world as long as you have either Wi-Fi or Mobile internet coverage. Wide choice of Ness radio PIRs, radio keys, radio reed switches, radio smoke detector, radio keypad and more. Touchscreen keypad with best looking and most functional alarm interface ever made. Photoelectric Smoke Alarm BCA compliant. CSIRO certified and listed to AS3786 Low profile design in ceiling white casing. All-in-one wireless package unit. Best security protection to you & your family.